Why should construction surfaces have to be waterproofed? The need to waterproof building surfaces exists because it is absolutely necessary to prevent moisture penetration into substrates and all adjacent building components thereof. Thereby, one avoids all related problems caused by moisture. Problems such as weathering, construction/lining element detachments, weakening of structure and structural products, rot, concrete carbonation, the creation of an environment that favors the creation of mold, black spots, fungi and other pathogens. 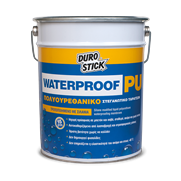 What are the benefits of waterproofing a building structure or house? Generally speaking, every building structure or house is a ‘living, breathing organism’ that reacts with the environment surrounding it while affecting and being affected by that very environment. Therefore, the waterproofing of a structure or building, in terms of its different structure elements (roof or rooftop, walls, basement, ground floor etc), functions as a barrier that prevents moisture from penetrating into the outer construction elements but into the indoor spaces as well. So, by waterproofing the building structure, one protects it from wear, preventable damage, and deterioration that moisture definitely causes. In addition, waterproofing of a building prevents the negative effects of moisture to the indoor microclimate as well, thus significantly improving living conditions of the people residing in it. What waterproofing solutions and products are available to me? How can I choose? 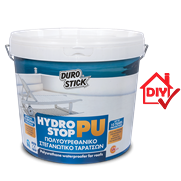 The available options, in terms of waterproofing products, are many and beyond the scope of this text. However, the options most frequently found and implemented are the following: cementitious waterproofing products such as HYDROSTOP ROOF and TWO COMPONENT HYDROSTOP, elastomeric waterproofing products such as DS-220 and No39, as well as bituminous/asphalt based materials. All above products and their applications have their advantages and disadvantages. Proper waterproofing requires knowledge and strict adherence to the application instructions of the chosen product(s). Those applications are usually carried out by professionals. 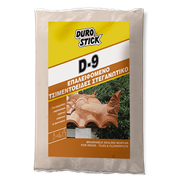 However, non-professional individuals can also apply waterproofing products, mainly elastomeric products for roofs with simple application steps, using a roller and/or a brush. 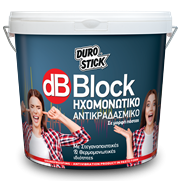 Waterproofing vertical surfaces (walls, foundation walls) is usually accomplished with elastomeric paints which present waterproofing/sealing (D-80 of DUROSTICK), or even simultaneously waterproofing/sealing and insulating properties (THERMOELASTIC COLOUR of DUROSTICK). 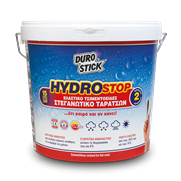 The waterproofing of wet spaces or surfaces (underground areas, basements etc. ), or areas and spaces exposed to permanently increased moisture levels, (swimming pools), is accomplished with specially designed products for such difficult and demanding applications. 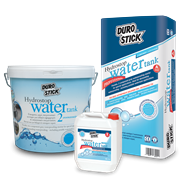 Those products sometimes (depending on the product chosen), have approved certifications, as per their quality as well as their performance (WATERTANK, D-1 of DUROSTICK). How and where do I start? What do I need to know and what should I take into consideration before proceeding to the waterproofing of my space/area? Start from the most vulnerable areas of the building. Areas being most affected, and, in turn, affect themselves the 'health' and proper function of the building. Such areas are the sloped roof, the flat roof of the building, and the basement (if one exists). One has to always weigh the gain versus cost factor of the application, the duration of time without damage and losses, whether one can apply the product by him/herself or somebody else (a craftsman or a professional) has to implement this application (additional labor cost) etc. Take into account the use of the waterproofed surface, whether the waterproofed surface (roof) will be a visited area, if any lining will be installed over the waterproofing product, whether immediately after the waterproofing or in the future, additional applications will be implemented over the waterproofing (roof garden creation etc). Last but not least, one has to consider if the surface will be thermally insulated as well as waterproofed etc. What is the most appropriate time period to waterproof indoor and outdoor surfaces? There are no time restrictions or ‘appropriate’ time periods for indoor waterproofing or sealing applications. The same is not true when it comes to outdoor applications though. Usually, most waterproofing and sealing applications are completed when temperatures are not too hi (above 35oC), or very low (below 5oC). It is also very important to not expect any rain 24-48 hours after the completion of the application. Please keep in mind that the relative humidity in the atmosphere should not exceed the 70% mark, because, in such case, the curing time of the waterproofing product will be extended. 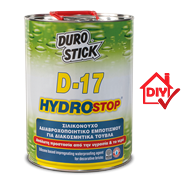 In keeping with the ideal waterproofing/sealing time periods, as explained above, traditionally the application periods range from late spring to early summer and during the autumn season, with ideal months being September and October. Obviously during those select periods, everything depends on the weather conditions prevailing at that time. Obviously, one can also utilize the dry periods during the winter season, just as long as one follows the temperature limitation rule (no applications when temperatures are, or will drop, below 5oC. 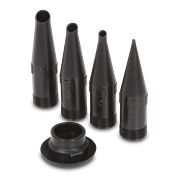 What is a waterproofing product suitable for positive and negative pressures? We will explain with an example. The waterproofing of the buildings' basement is usually done during the construction stage, and always before the backfilling. 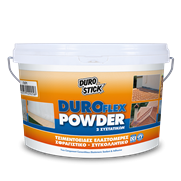 The waterproofing product is applied to the outer sides of the buildings' foundation walls. 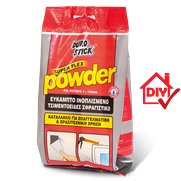 The product now works as a barrier blocking all the moisture coming from the ground, which is touching the sides of the building, from entering into the wall structure of the foundation and the basement. The pressure that the ground moisture applies to the wall surfaces while trying to penetrate in, is defined as 'positive' pressure. Now, let us assume that the basement is not waterproofed as described above, and there is a need to waterproof and seal it. 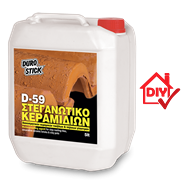 This waterproofing application will have to be done from the indoor part of the wall structure since the backfilling is completed and it is not cost effective to reopen a trench around the building. 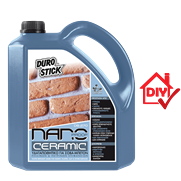 It is imperative to ensure the stability of the substrate (brick, plaster, concrete element) and then waterproof the inner wall surfaces. Once the soil/ground moisture penetrates through the wall structure, it 'attacks' the waterproofing coat(s), which then serves as moisture barrier preventing that moisture penetration into the inner space of the basement. The pressure, in this case, is defined as 'negative' pressure. 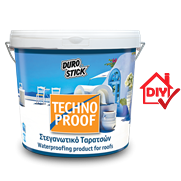 The waterproofing/sealing product that performs satisfactorily in both cases is deemed as a product compatible and suitable for applications affected by either positive and/or negative pressure. Can I waterproof on my own or do I necessarily need the assistance of a craftsman/professional? Waterproofing is a job or a project that differs, depending on the waterproofing product and the application method. If you are handy and you possess some knowledge of the application steps (from relevant brochures and texts, filmed applications, the Internet etc. ), then yes, you can do it. Caution: Pay special and close attention to the substrate. It must be properly prepared and receive all necessary interventions in order to accept the waterproofing coating(s) safety. That will ensure the application results and maintain its effectiveness for many years to come. 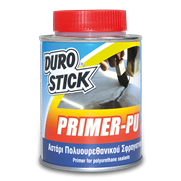 Elastomeric waterproofers, as well as some polyurethane sealing products, are applied as regular paints, using an emulsion brush or roller. They are easy to apply, even by someone who is not experienced in these types of applications providing that one strictly follows all application instructions. Cementitious waterproofers typically require the encasement of a reinforcing mesh during most roof application, in between the waterproofing coats. 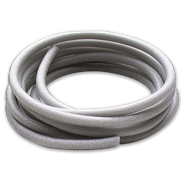 This application detail, together with the preparation of the waterproofing product itself, is what makes cementitious sealing products a difficult case, in terms of their preparation and application. However, if one is very meticulous in following all preparation and application instructions, then yes, you can do it yourself. Asphalt based products (rolls, torch down etc.) 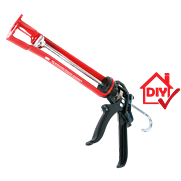 are a different case altogether, and it is highly recommended to allow for a professional waterproofing crew to apply them. In any event, any waterproofing application without the help of a craftsman or a professional greatly reduces the total cost of the project, since labor costs will not be added to the total expense. How do I ensure the expected, (as per the product), excellent results and long term durability from the waterproofing with minimal damage? The best way to ensure excellent results is by starting with the conditioning of the substrate, which should be clean, stable, and free of all loose sections, foreign objects, and dust. Also, the conditions during application (temperature, humidity) and immediately after that application (24-48 hours), should be the appropriate ones, as described by each one of the waterproofing products' application instructions. 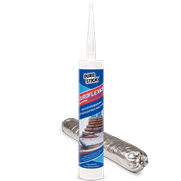 Another factor for a successful application is the literal compliance with the application instructions, as provided by the manufacturer of the waterproofing product on the packaging itself. Regular inspections (at least once or even twice a year) will help to detect any and all possible damage at an early stage. That will allow for immediate repairs to be performed before the damage develops into a major problem. Can I repair the waterproofing surface (membrane)? If we are talking about a small range, spot damage, then yes, it can usually be repaired. Make sure to check if moisture penetrated (and maybe trapped) into the waterproofing substrate(s). It is imperative for that moisture to be removed before doing any repair work. In cases where major damage occurred, it might be necessary to waterproof the entire surface again, using the same or different type of sealing product. Traditionally, one repairs elastomeric surfaces with elastomeric or polyurethane based waterproofers, cementitious waterproofers with cementitious or elastomeric products, and vice versa. However, one can repair asphalt/bituminous products using elastomeric sealers, but only under certain conditions, limited damage range (area to be repaired), as well as limited duration in time. Detailed application and repair instructions can be found in the technical documentation of each product. 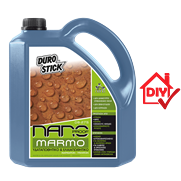 Does the color of the waterproofing product matter? It is always a good thing for the waterproofing coating to be of light color, preferably white or whitish. In this way, the waterproofer better reflects sunlight and better emits (dissipates) the heat accumulating on the building surface. This does not apply to asphalt type waterproofing products. 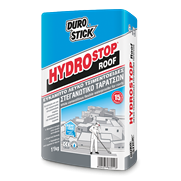 Some white waterproofers/sealers are certified as 'cool' material, products such as HYDROSTOP ROOF, No39, and DS-220 of DUROSTICK, to name a few. Products with this certification constitute ideal waterproofing solutions since they possess both sealing as well as thermal insulating properties and abilities. Their insulating abilities mainly derive from their reflective action but also derive from their waterproofing function as a moisture barrier that prevents moisture penetration into a surface that reduces the thermal conductivity of the construction element. What do I do if moisture or even water penetrates under/behind the waterproofing coat? It is very important to assess the extent and the cause of the problem. That is why one must locate the penetration point(s) of the moisture by carefully examining the entire surface. If the cause is due to plumbing or sewer pipe failure(s), repair them before proceeding with any other action. In some cases, it may be necessary to remove some small sections of the waterproofing coat(s), or some elements of the lining (tiles or other material), to reach the substrate. These types of work are usually carried out during the warmer months of the year. Those are the right weather/ambient conditions that will assist in the dissipation and evaporation of any accumulated moisture to the substrates. The installation of ventilation devices usually concerns waterproofing applications that use asphalt/bitumen based products. Once the moisture is located and removed thoroughly from the substrates, proceed with the repairs as needed, by patching sections of the surface(s) or by waterproofing the entire surface over. Usually, lightweight filling materials act as water accumulators so, in some cases, the substrate of the waterproofed surface will accumulate a large amount of water and/or moisture. For those cases, it might be advisable to remove both the waterproofing coat(s) along with the substrate (filling material) and reapply them both new. What do I do in the spots where the waterproofing stops/terminates (railings, pergolas, metal or other types of support bases, posts), and why? 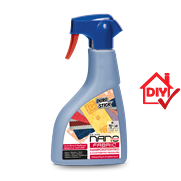 Thoroughly clean on and around all breakpoints and remove dust, any loose materials and foreign bodies (preferably with compressed air). Continue by applying the sealing product in the selected area/spot or the entire surface. The next step is to seal around the breakpoint (perimeter or otherwise), using a flexible polyurethane based sealant (use polyurethane based sealant for elastomeric and cementitious waterproofers). The reason one must necessarily do this job is because breakpoints always function as potential moisture penetration points. Those points usually create problems and bypass to a greater or lesser degree the waterproofing coat(s), and subsequently trap moisture in the substrate(s). 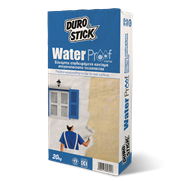 What kind of support does DUROSTICK provide before, during, and after the purchase of its waterproofing products? 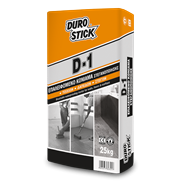 DUROSTICK is next to you, from the initial stages of looking and finding/discovering your own personal solution(s), the selection and purchase of the appropriate, for each case, waterproofing products, but also during the application steps and beyond. 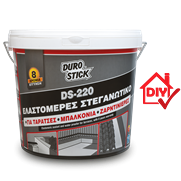 Available for you in most of our points of sale, you will find brochures as well as material in digital form (DVD) concerning the application of our waterproofing products. You will also find live samples with applied products for you to feel, touch and experience their effectiveness. Our Technical Support Team via phone, e-mail, special applications, and mobile app support, is available and at your disposal 24/7. 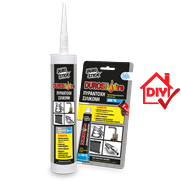 On the company site and at the DUROSTICK channel in YOUTUBE, you will find extensive presentations of our waterproofing products and step by step, comprehensive filmed applications of those products. Why is it necessary to apply sealers on building structures? The construction of a building, among other things, requires fitting together different materials and creating joints at various junctions of the building surfaces. Additionally, different kinds of smaller or larger cracks are constantly forming due to manufacturing defects; temperature related expansions and contractions, as well as the effects of loads (weight) and stresses. It is also common to notice manufactured expansion joints become wider and expand further than designed (construction defect). 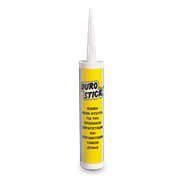 Joints and cracks are usually penetration points for moisture through the building elements. The detrimental effect of moisture penetration is evident in walls, floors and ceilings (especially inside a building/structure), and include the degradation of the indoor microclimate quality. The damaging effects of the same moisture penetration might be slower to manifest, however, the results are more significant for the structure of the building. 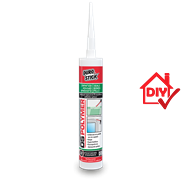 All of the above are just some of the reasons that make sealing of cracks and joints an absolute and immediate necessity for every structure and building, by always using the appropriate products. What are the benefits a building (or a building surface) gains by applying the necessary seals? 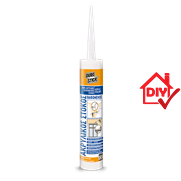 The reason for sealing various, mainly outdoor joints and cracks on a building or a structure is to ensure that outdoor moisture will not penetrate into the wall surfaces and pass through it to the indoor space(s) of that building or structure. Joints such as the ones around door and windows casings, termination points of various linings or edges, expansion joints, around penetrations through linings (railing and pergola posts, equipment support structure penetrations etc. ), perimeter termination points and joints between lining and skirting or wall etc. Cracks such as the ones noticed on wall surfaces (hairline or bigger), as well as various lining cracks on horizontal or vertical surfaces and linings. 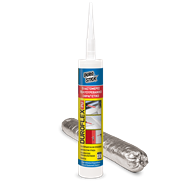 Some of the benefits for sealing cracks and joints are: Maintain the thermal conductivity of a wall and its insulation properties. Maintain the properties of the materials composing the wall(s) (the bonding strength of a product, which is limited and compromised in a wet environment). Avoidance of mold creation and appearance of black spots inside the building (usually). Also avoidance of flaking and disintegration of the paint, salt discharges through the mass of the concrete to the surface. What type of sealers are available to me? How can I choose the right product each time? Where do I start from? What should I know and take into consideration before starting any sealing project? One must know that like any other construction application, the condition of the substrate (stable, clean, primed or soaked) is an unavoidable and necessary part of any successful application. 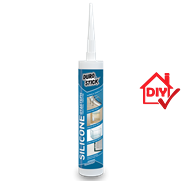 The substrate has to be the starting point for any sealant application. 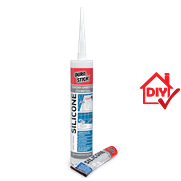 One must also be sure that the appropriate sealant (compatible with the specific application), was selected and/or purchased. 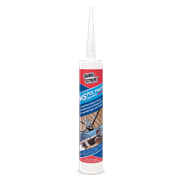 All compatible and appropriate applications and uses of the sealant must be described in detail in the specification text of the product, usually printed on its packaging. If the product does not carry any specification/application information try to avoid it. If you have doubts or reservations about the selection or the proper use of a product, please contact the Technical Support team. Please be advised, one also needs to ensure that the environmental conditions, during the application and even after it, is in conformity with the product instructions until the complete curing/solidification of the sealant. Can I do it myself or should I seek expert help (craftsman)? Yes, in most cases you can actually do it yourself, depending on your familiarity with the use of building materials and products. Read and carefully follow the application instructions found on the packaging of the selected sealant. One must also make sure that the product is the right solution for the sealing problem he/she is dealing with. If you still don't feel confident for the application or for the results, then consider it appropriate to seek the help of a professional (craftsman). How can I ensure a great outcome and its duration in time? Ensure the outcome by first choosing the appropriate and correct sealing product(s). Branded, certified products should be considered to have the quality required to ensure results which they claim they can achieve. Make sure the substrate is of appropriate condition for the application or, if need be, create those conditions. Carefully follow all the use and application instructions. Take into account the environment in which the sealant will be applied and remain during its life span. What do I do if the seal fails (detachment, cracking) and/or mold or black spots begin to form around the sealed area? Carefully remove the existing seal completely. 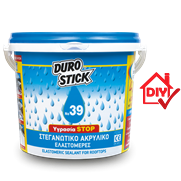 Clean and disinfect the area using a bleach/water solution or by using DUROSTICK D-95 to remove any mold residues and microorganisms. Allow for the cleaner to act for a few minutes and rinse thoroughly. Assuming you chose the right sealant, and you adequately familiarize yourself with the application method, proceed to reseal the area. Does the color of the sealant matter? Most sealants are usually white, off-white or gray. However, in many instances the sealing points or joints are located in an environment with color(s), and the lining elements themselves are from a specific material (wood, stone, tile etc) which are usually of color(s) as well. 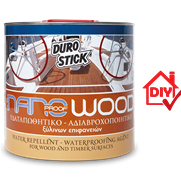 For those situations and mainly for aesthetic reasons, choose colored or paintable sealants (DUROSTICK DS -POLYMER (32 colors), DUROWOOD DS-POLYMER (10 wood colors). When I am sealing a crack, how will I know if I am just repairing a minor problem or I am just covering up a major one that could develop into a big problem in the future? The major and most important difference when one examines one or more cracks on a building surface is whether the crack occurs on a load bearing element of that building or not. Cracks on load bearing elements may even affect the stability of the building and for that reason they should be treated with extreme caution, and when possible to be examined by specialists (engineers). Those cracks are not always visible to the naked eye, especially on surfaces that are lined in layers/coats (plastered or tiled surfaces). Those types of cracks might begin at the surface and extend deep into the structure element. This is one of the reasons that it is considered common practice and almost required to 'open up' (widen) the crack to see how deep does it go. Depending on the findings, plan the appropriate and safest way possible to repair the crack(s). Continue by select the repair product. 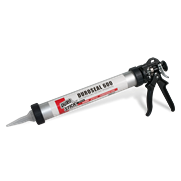 For crack repairs on load bearing elements, the products that are used most often are epoxy based sealants. Those types of sealants are applied with a specialized procedure and for this reason, it would be advisable for such a repair to be carried out by professional specialists and in any event, after consultation with an engineer. 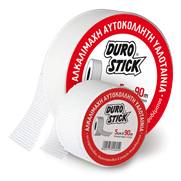 What kind of support does DUROSTICK provide before, during, and after the purchase of its sealing products? 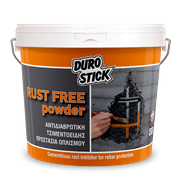 DUROSTICK is next to you, from the initial stages of looking and finding/discovering your own personal solution(s), the selection and purchase of the appropriate, for each case, products, but also during the application steps and beyond. Our Technical Support Team via phone, e-mail, special applications, and mobile app support, is available and at your disposal 24/7. We are next to you, by making our vast information, knowledge and experience available to you in print and digital format. We are next to you with educational videos for the correct and proper use of a variety of our products. All of the above are available for you, at our points of sale and of course on the Internet, and even by mail.